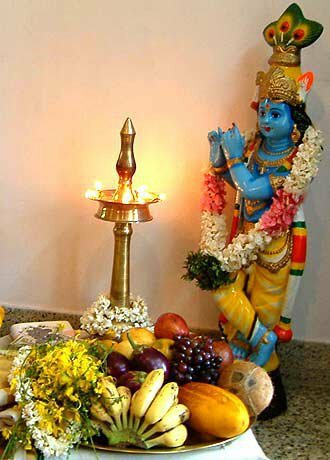 Vishu is the New Year festival of the state of Kerala. It is celebrated on the first day of the first month Medam (March – April) of the Malayalam calendar. It is among the most popular celebrations in Kerala and is celebrated in great pomp and splendor. Vishu festival is all about welcoming the spring season and it is usually celebrated on April 14 every year. Vishu celebrations in Kerala are worth watching as each household celebrates it with crackers and lights, irrespective of religion or caste. The ‘Vishu Kani’ or the first sight of the day is what decides how the year ahead is going to be. The Vishukani is prepared with an assortment of items like raw rice, gold, silver, coins, holy text, some particular vegetables and fruits, all of which are beautifully arranged on a tray. The youngest members of the family are ushered in the front of the Vishukani with their eyes closed. They are then asked to look at these items. This is done usually at dawn and it is the elders of the family who prepare this tray for the youngsters. It is strongly believed that seeing the images of God and goods arranged in the Vishukani will bring prosperity to the members of the family in the coming year. Wearing new clothes and visiting nearby temples is a ritual of this day. The Gods are praised and thanked for the year that went by and prayers are offered to get their blessings for the New Year. Almost every house in Kerala will be decked up with flower garlands and lamps on this day, as it is believed to bring in good luck and positive energy. Vishu Kaineetam is offered to all the kids of the family by the elders. This is a small amount of money given to them to make sure that they achieve prosperity in life later on. The Vishu feast is the most awaited part of the festival. All the traditional food items that are prepared on this day are absolutely lip-smacking. Everyone who is planning to celebrate Vishu at home this year, can use our free online invitation cards to invite your near and dear ones for the special celebrations.